Recently I went to a place some New Zealanders have referred to as Atlantis. I brought back these notes and photos. 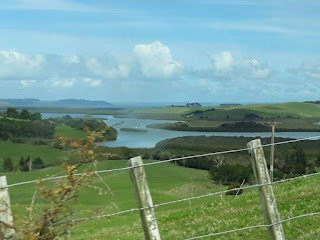 The road to Atlantis begins at Wellsford service station, where we watch shoals of SUVs & VWs heading northeast, towards the beaches & golf courses of Tutakana, the Bay of Islands. They roll past with the self-assurance common to migratory creatures. 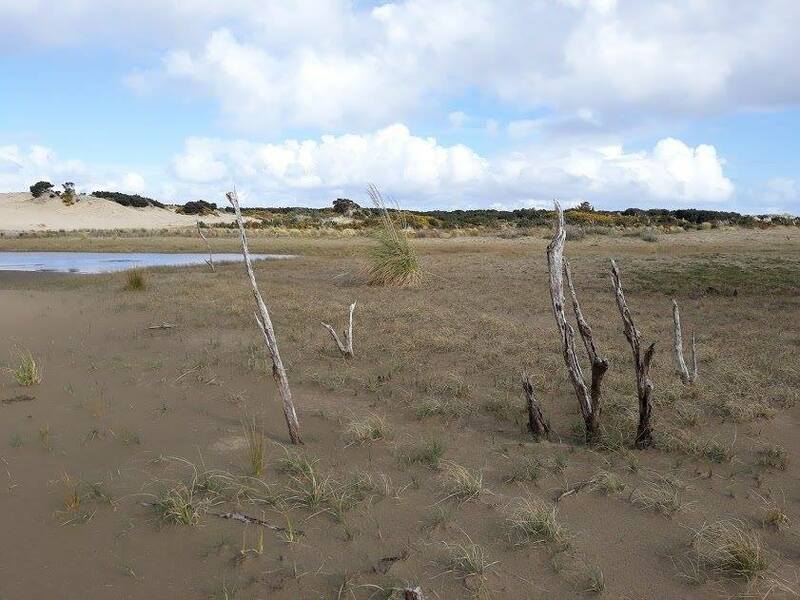 We will turn west, aiming ourselves at Taporapora, the great sunken motu of the Kaipara. The rivers that extend towards the Kaipara harbour are tubercular throats, clotted with phlegm-green islets, sandbar-cysts. We wait for the road to change, listen for its gravel voice. On the map, Taporapora peninsula resembles an old fashioned teacher's wagging pedantic finger. The isthmus is named for the broad flat land, adorned with kainga, plantations, & a whare wananga, that once extended beyond it, all the way to the mouth of the Kaipara harbour. A sliver of sand & toitoi remains: this relict island is known as Manukapua. 'Only the ship of fools' WH Auden wrote, 'is making the voyage to Atlantis this year'. Our party fills two ships: a Honda Odyssey, which my wife drives suspiciously over the worsening, winding road, & her brother's white van, where his kids & ours bounce like fluffy dice. The lost land of Taporapora survives in the mouths of Te Uri o Hau, & other fractions of the great iwi of Ngati Whatua. The Mahuhu waka, storytellers say, threaded the harbour heads, & disgorged the chief Rongomai at the island. He married a local, planted crops from his tropical homeland of Hawai'iki. 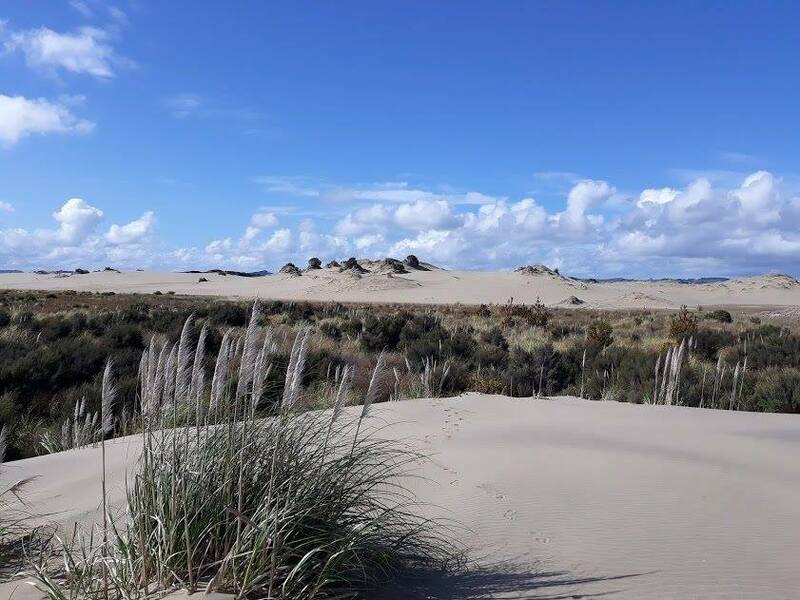 Archaeologists may cite Wairau Bar, that vault of artefacts & bones, as the first site of human settlement in Aotearoa, but there is reason to favour Taporapora. In a chant to Io transcribed in the 19th century, the island is named as the first work of the god. 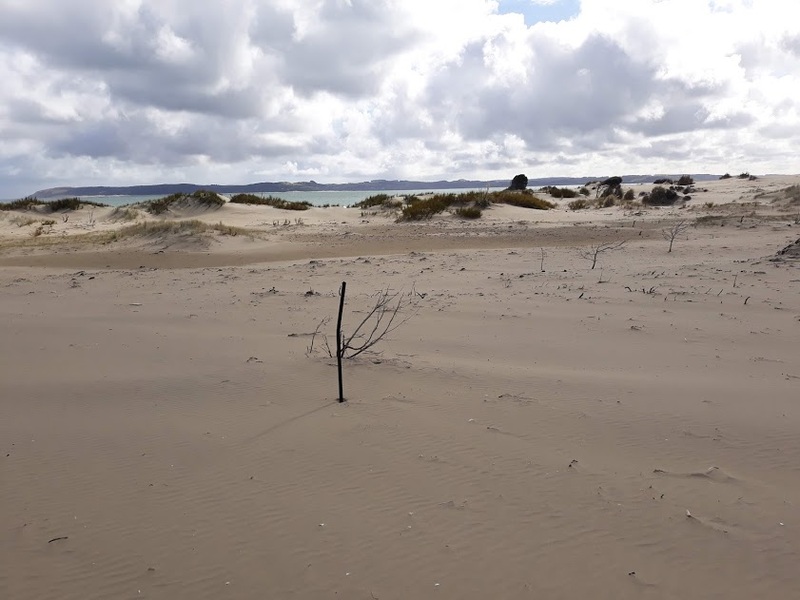 Iwi that are today scattered across Te Ika a Maui remember ancestors who tilled the island's soil, and who now lie under Kaipara mud. Rongomai, the story says, went fishing one day in a waka tiwai, & was swallowed by the jaws of the harbour. His brothers took a nihilistic revenge: they cast spells that stirred the sea, until its waves ate Taporapora. If Rongomai had to die, so did his fellow islanders. 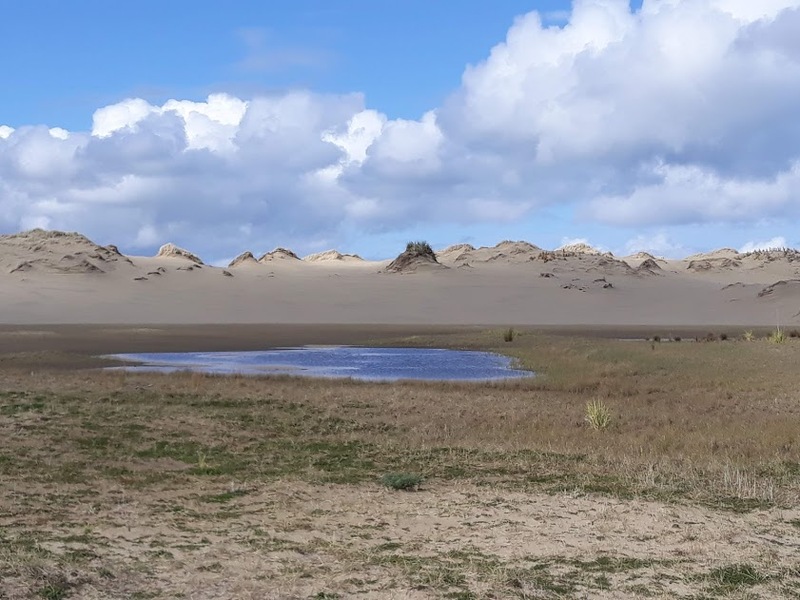 Drowning became a habit, for the peoples of the Kaipara: in the nineteenth century, scores of Pakeha ships were interred in the sandbars of the harbour; just last year, half a dozen men drowned when a chartered fishing boat flipped at the heads. By the twentieth century those most unreliable ethnographers, the editors of Pakeha newspapers, had discovered the tragedy of Taporapora. The island was, the Pukekohe & Waiuku Times told its readers in 1921, a 'Maori Atlantis', and a 'cheap edition' of Plato's tale. We pass Port Albert, the utopian city that became, a few years after its founding by three thousand radical Christian settlers in 1862, a utopian hamlet. The city's founding sects split as regularly as bacterial cells; chapels spread along its ridges instead of houses & fences. This is a weekend drive, an adventure for the kids, & also a reconnaissance mission undertaken on behalf of the most ferociously original artist in the tropical Pacific, Visesio Siasau. Siasau and I have dreamed of making the lost island in the Kaipara a bridge back to his homeland of Ha'apai. 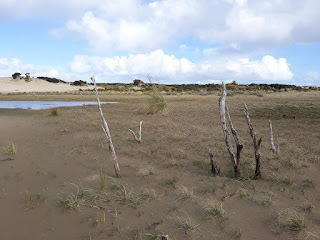 I have tried to convince Siasau that Taporapora may have been a tropical Polynesian fragment of ancient Aotearoa, a Mangaia or Pukapuka afloat on the temperate waters of the Kaipara. Stories say hiapo were grown & tapa was made on the island; archaeologists and fishermen have found tapa beaters in harbour mud. The tools are very rare elsewhere in Aotearoa. The ridge concedes the road to the flat end of the peninsula, where a hamlet of baches - mean things, the size of duckshooters' hides, whose tenants, I have been warned, shoot fentanyl into their feet & 22s out their windows - has grown like a moustache above a creek-mouth. The paper mulberry plantations may have drowned, but exotic crops still burgeon in the Kaipara's microclimates. Near the turnoff to Manukapua, we pass avocado orchards insulated against sea winds by bamboo. Should we be speak of Lemuria, rather than Atlantis? Clement Wragge, a meteorologist, theosophist, & pioneering Pakeha pseudo-historian, used that name for a sunken continent that had these islands as its remnants. In 1910 newspapers reported Wragge's discovery of Lemurian megaliths, huge stone temples, in the Bay of Islands. Nobody else has seen these monuments. It was not only theosophists like Wragge who thought Aotearoa a relic of a sunken continent. Hare Hongi, the first scholar to work at both a whare wananga tohunga & Pakeha universities, insisted Polynesia's motu, from Hawai'i to Tonga to Rapa Nui, were fragments of an ancient continent, a primordial superpower. For Hongi, who spent his life trying protect indigenous culture from both neglect & appropriation, an ancient super-continent of Polynesia was a source of mana, even if it put vaka of his ancestors into drydocks. We turn down a road of dirty sand, sniffing for the sea. My brother-in-law belongs to a fraternity of off-road drivers. They wink wistfully when they spot each other through rain and jammed traffic on Auckland's Monday morning motorways. 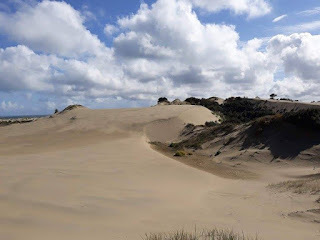 Each knows the other is dreaming of a route like this one: sandy, rutted, circuitous, empty. Sitting under a heaven of coconuts & bats on Lifuka, an atoll sinking slowly into the same sea that ate Taporapora, Siasau & I discussed expeditions, technologies. We imagined piloting a submarine whose stainless steel crab-pincers could dig through Kaipara mud, & reveal koloa, taonga: pearl shell lures from Mangaia, obsidian adzes from the sheer volcano of Kao, war clubs cut from the forests of 'Eua, a necklace made with the hair of coconuts, a necklace holding a gold coin salvaged from a Spanish galleon that sailed over the edge of history. The road becomes a track, then a trail, as the sharp fire of spring gorse spreads. We abandon the Odyssey for the van, which wallows comfortably in each rut & pothole, confident in its four wheel drive. The nearing sea makes the sound of wind in the gorse. The kids are first out, first into the shallow channel that separates us from the surging dunes of Manukapua, last remnant of Taporapora, Atlantis, Lemuria. Aneirin stops, turns, adopts the shocked expression of a scout who steps on a mine in a bad war film. A crab has his toe. In 1936 a new railcar was unloaded in New Zealand. It had been painted a brilliant red, the colour the head dresses of Polynesian chiefs, & boasted a stained glass window. An article in the in-transit magazine of our rail network explained that the new vehicle was named Mahuhu, after the waka Rongomai brought to Taporapora. Wood had become steel. In the mellow late afternoon light, the gently curving dunes on the edge of the island resemble the walls of some art deco castle. A small sandstorm, a swarm of irascible insects, rises somewhere inland. To travel in space is to travel in time. The Kaipara exists mostly in the past: it was a Maori heartland, where a dozen iwi contested rivers & hills, before Hongi Hika brought his terrible peace from the north. Pakeha flourished then foundered on abandoned gardens, forests. 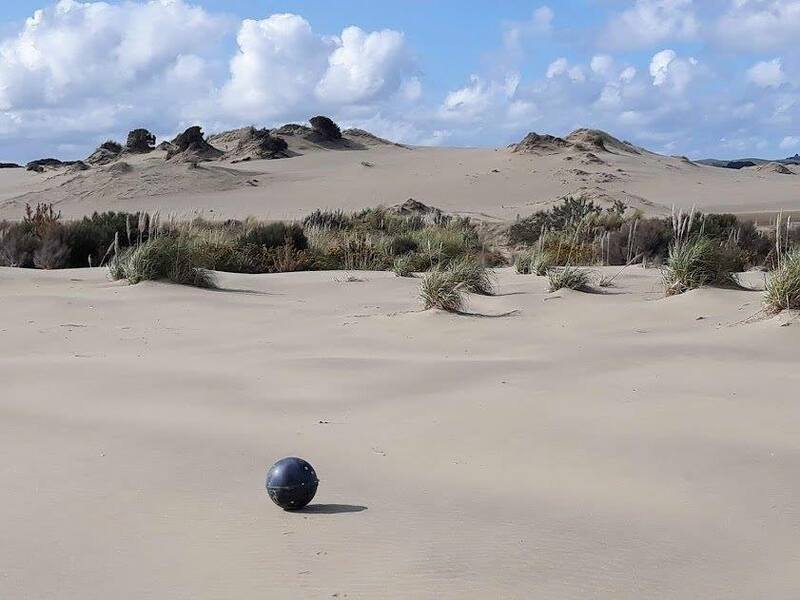 In an article for Te Ao Hou in 1962, Colleen Sheffield made the sands of the Kapiara into a metaphor for futility. 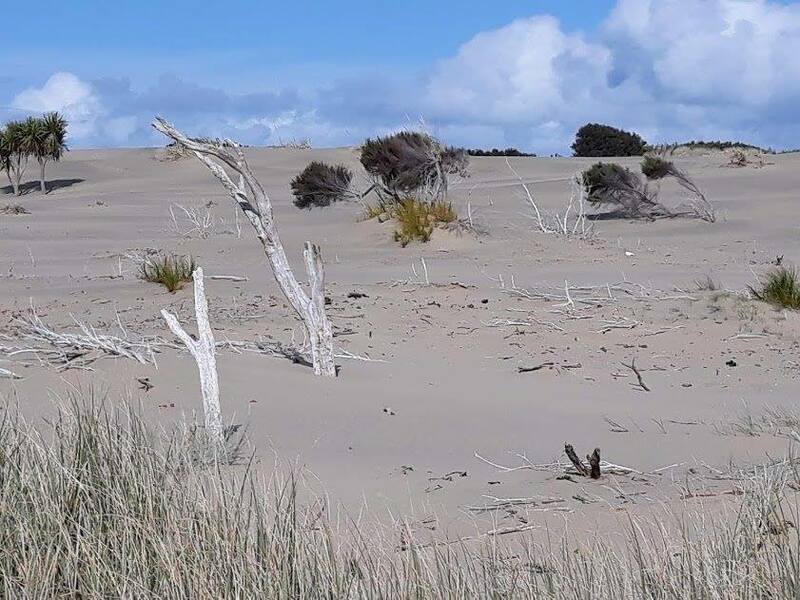 Cook, she noted, called the Kaipara 'the desert coast'; dunes drowned Depression relief work camps of pine planters as surely as the sea covered Taporapora. The sands of the Kaipara are as merciless as the desert that drowned Ozymandias' works. I think about the name Manukapua. I can see manuka sheltering in sand gullies; pua means to bloom. Are these pygmy trees the remnant of some ancient forest, or the vanguard of a new one? No birds adorn their frail boughs; no blossoms whiten them. 'Imagine' Siasau said, 'if the island had survived. They might have had kava & tapa in Aotearoa, but without the rules, the restrictions on drinking & painting, that chiefs created in Tonga. They might have been able to plant & harvest their crops, without having to offer them as tribute to a god-king. Perhaps it could have become a utopia.' I can hear his voice now, through the static of a cold harbour wind. 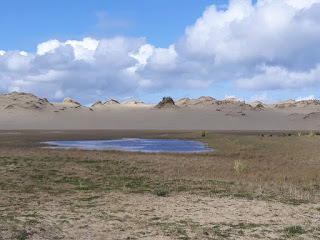 In the centre of the motu I find a small lake, surrounded by drying mud. 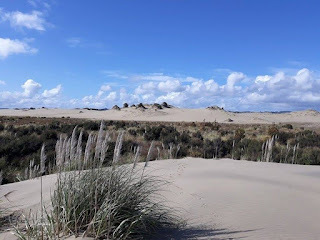 Is it the remnant of some ancient lagoon, and did the dunes beyond the mud bury plots of kava, hiapo? This landscape is less real the past that bequeathed it. 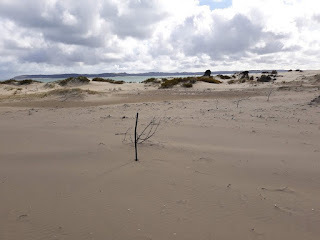 I follow a procession of wireless iron fenceposts until they disappear into the dunes, like a party of Victorian explorers lost in the Sahara or the Australian Outback. On the windward coast, waves that have passed straight through the harbour mouth deliver trophies from dead ships. Lui picks up a fishing float: it is round & black, like one of the bombs the airforce drops a short flight away, on Muriwai beach. Near the lagoon-pond, I notice a row of slim & gnarled trunks rising like dead men. They might be the palisade of some pa or kolo stormed by sand, by water, by history. It is late afternoon. It is time to leave. 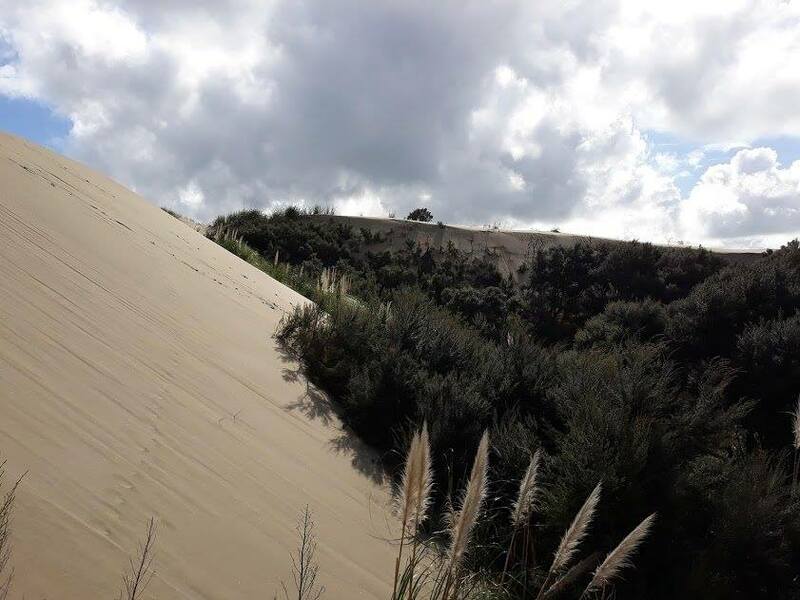 The steep dunes on the leeward coast glow darkly, like the pyramids of an alien civilisation. You are not a journalist but an ordinary citizen.Do your duty and report this crime that you know about. Wait. You are an internet troll. Ooh no just another made up story. anything for attention and drama. the truth is not an option with you is it? The tongans should ban you from the place. You are bad news and full of lies. how can you bring such disrespect to a place that you claim to love so much?? Thats fake too. Wow excellent your work .I appreciate that.You gave to photo with small explanation.I like that places.I am in all actuality content with article quality and direction. You can make use of this custom essay writing service paperwork for any sort of scholastic written work. Our on paper work benefit is having encountered specialists for making a wide variety of activities is capable way.